Between homework assignments, tests, quizzes and valentines there can be a lot of paper being transferred around the classroom, that's where a classroom mail sorter comes in. 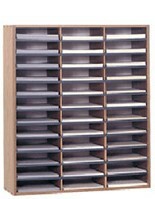 A multi-slot classroom organizer stores paper in separate compartments so that it can be separated and distributed to the intended recipient. 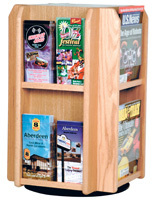 Constructed from wood, steel or another durable material, these rectangular boxes are generally set up in an easily accessible part of the classroom, at a height that is reachable by everybody. Labels are fixed next to the slots to mark names, preferably in alphabetical order, so that the children know where to find their work. Teachers can distribute in-class assignments, notices, course materials, or any other hard copy material into the classroom mail sorter before class starts to save time. The students can check their compartment upon entering the classroom, and turn their assignment into the sorter when leaving, making for a seamless transition. 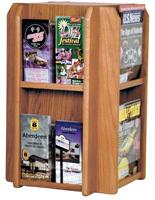 A classroom mailbox organizer can also be used in the main administrative office, to compartmentalize incoming mail, pamphlets or brochures and distribute it to the teachers. 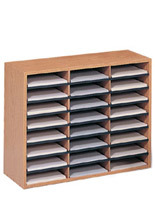 When choosing a classroom mail center, make sure that an adequate number of slots are present, to represent the number of students or offices that will be receiving literature. 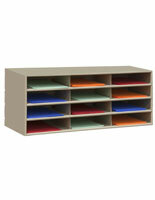 The ones pictured here have up to 36 slots, which should accommodate even the largest classrooms, however multiple smaller classroom mail organizers can be used in conjunction to create a larger unit. 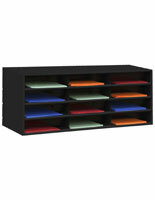 The size of these literature organizers will depend on how many compartments you choose, but they generally do not exceed three feet in width and a foot in depth, meaning this is a compact solution for any classroom, and will not take up a lot of space. Choose between a natural beige color, a midnight black or a light brown oak construction. Don't be afraid to let small kids decorate the box with stickers and other fun stuff! 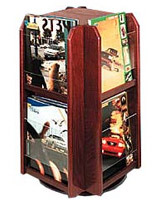 One popular selection is the 24 pocket wood paper organizer which includes a sturdy carboard backing to prevent papers from sliding out the back. 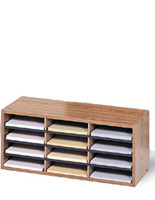 This countertop mail sorter includes the sticky labels needed to help file mail by student.